Another meal made awesome by H-Mart. On my last trip I picked up a few basics – giant bottles of soy sauce, rice wine vinegar, sesame oil. Also soba and ramen noodles. And, of course, produce. I know its not seasonal or local, but its still kind of winter here and I was craving mushrooms. I bought these beautiful kind mushrooms – huge and meaty – along with carrots, a delicate green savoy cabbage, ginger, garlic and shallots. 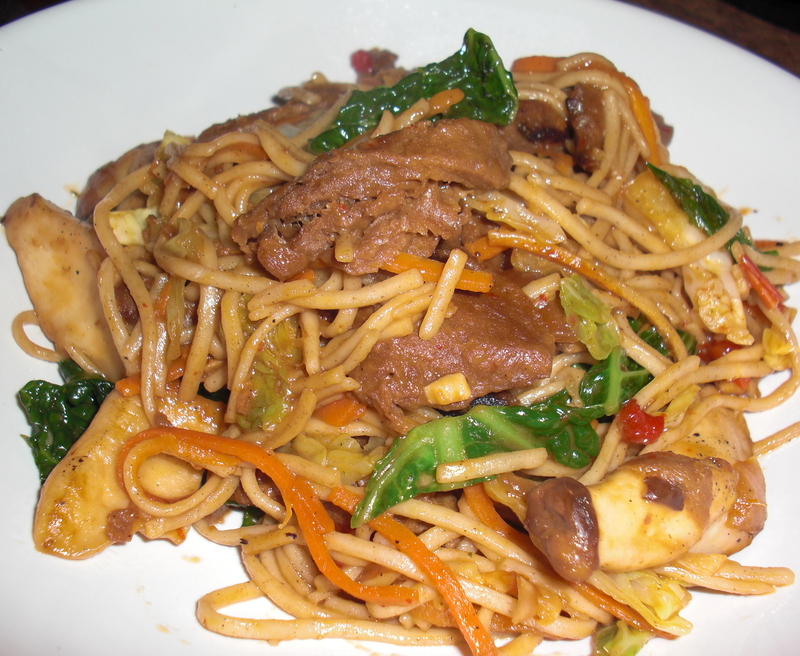 Some fake seitan “beef” strips, again not a usual for me but fun sometimes, came together will all the produce, the pre-cooked noodles, and a sauce of chili oil, soy, sweet soy, vegetable broth, sugar, salt, sesame oil and a pinch of flour to thicken. Nothing fancy, but a hearty, delicious, and quick meal.